The Presidential Election of 1868 was closer than Republicans projected, resulting in further Reconstruction attempts to strengthen Southern black suffrage. 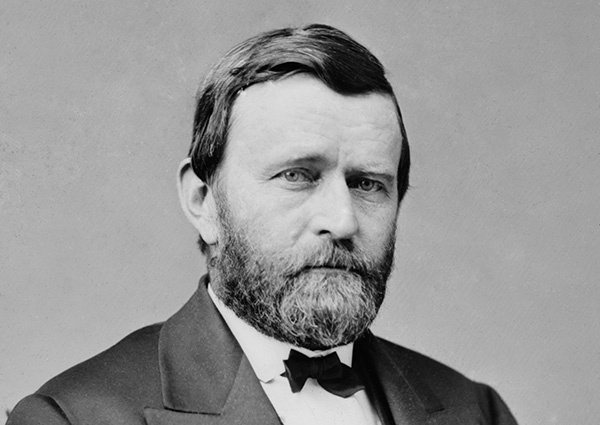 U.S. Grant was nominated by the Republican Party on the first ballot. Although representing Union victory, Grant’s slogan became “Let us have peace.” It was a phrase he himself devised. Grant had hoped war would not come and voted for James Buchanan in 1856. The Radicals knew the value of a name and Grant had saved the Union. Like other generals nominated to the presidency before him that had served the nation in times of crisis, Grant’s contributions resulted in the total defeat of the Confederate South. The Democratic Convention, meeting in New York City on July 4th, didn’t lack candidates. Although Andrew Johnson, General Winfield Scott Hancock, and Supreme Court Chief Justice Salmon Chase were considered, the convention finally nominated former New York Governor Horatio Seymour. Seymour was reluctant to accept. As a Northern “Peace Democrat,” Seymour’s war-time positions were suspect. Further, the Republicans used the election to brand the Democrats as the party of rebellion. The Republicans favored black suffrage as a means to extend and maintain political control in the occupied South. Equal suffrage was defined by the phrase “loyal men” in the South. The presence of Northern troops – even in those states that were “redeemed” or sought redemption, ensured Republican political victories. Any opposition from the Democratic Party resulted in the Republicans “waving the bloody shirt,” a reminder, first demonstrated by Benjamin Butler in the Congress, that the white South was still intent on denying “equal protection under the law” and perpetuating white elitist political control of Southern state governments. The Democrats in 1868 sought to restore all states to the Union. This included amnesty, a reduction of the army and navy, and the abolishment of the Freedmen’s Bureau. The platform was anti-black and anti-immigrant. Despite the platform, Seymour received 2,703,249 votes compared to Grant’s 3,012,833. In several states, Grant’s margin of victory was less than 5% of the popular vote. This included California, Connecticut, Indiana, and Pennsylvania. Seymour actively campaigned but Grant returned to his home in Galena, Illinois. In letters sent to friends, Grant indicated that he would return to Washington before the election. Letters in October 1868, however, indicate that he would not return until after the election. Grant was in no hurry to take the oath. Speaking to the citizens of Galena November 4, 1868, Grant states, “Sufficient has now been heard of the result of the late election to show upon whom it has fallen to administer the affairs of the nation for the next four years.” But Grant was not the master of his destiny. Grant’s victory, as recognized by the Radical Republicans, was due in large measure to the Southern black vote. The South also realized this and sought to implement measures – such as the use of the Ku Klux Klan, to hinder Republican political victories. But the Radicals were adamant. According to Duke University professor Alexander Keyssar, “In May 1870…Congress passed an Enforcement Act that made interference with voting a federal offense…” Northern occupation of the South guaranteed voting rights for blacks – who tended to vote Republican. The 1868 presidential election set into motion eight years of Reconstruction violence in the South that, after the sordid results of the 1876 election, left blacks in the South in no better position politically than at the start of Reconstruction.